When you take them out, it feels like you're laying an egg. After spending many months around Asia, I have learned to appreciate the healing powers of natural materials. 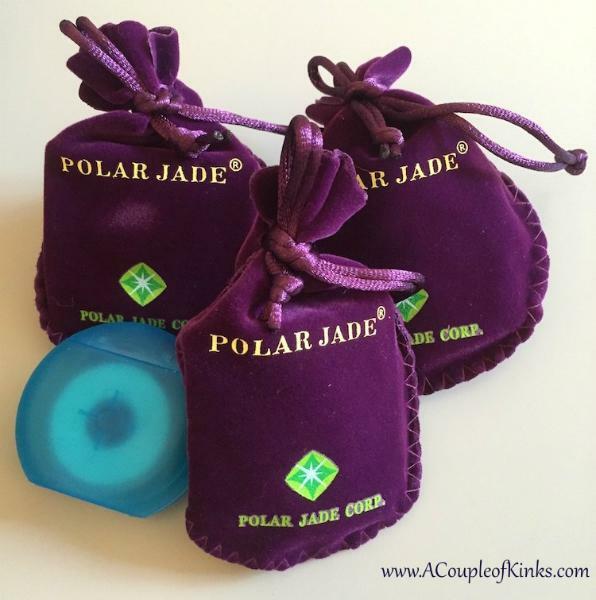 When I discovered Genuine Jade kegel yoni eggs, I was really excited to try them out. Not just for the natural materials, but also because I had yet to try out original-style kegel exercisers. We were interested to see how they would match up with our duotone system experiences. 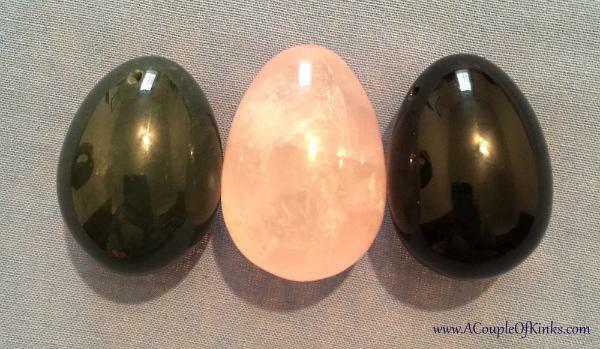 This three-piece set of yoni eggs comes with three different medium sizes eggs: nephrite jade, rose quartz and obsidian gemstone. Each egg is approximately 43 mm x 30 mm; however, the rose quartz in my set is slightly larger than the other two. Although they are approximately the same size, they are all different weights due to the different material densities. 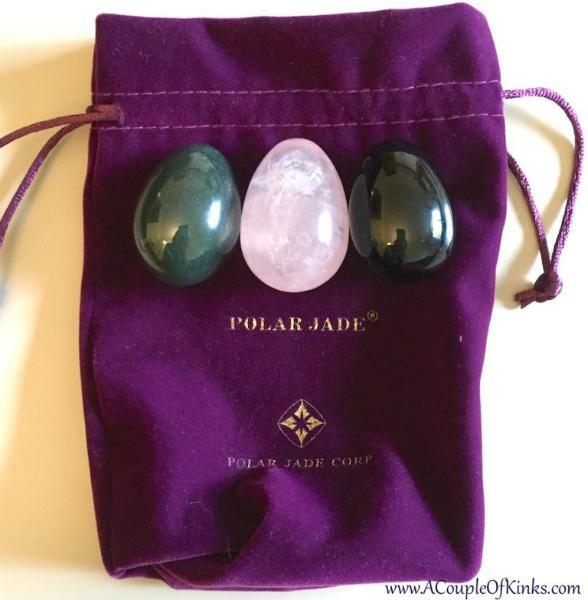 Obsidian is the lightest at around 46 grams, then the rose quartz about 55 grams, and nephrite jade about 60 grams. Of course, each listed weight is an approximation as they manually carve natural stones, which will cause certain variations. They are all polished without any chemicals and made without any dyes. Each egg has drill holes at the smaller end for inserting your own string. You should use a hygienic and disposable material like unwaxed and unflavoured dental floss. You do not need to use a retrieval string; it is just an option to make removal easier. Each stone comes in a separate velvet pouch with care information and care instructions specific to the different stone materials. The three pouches are then placed in a larger velvet pouch with a packet of dental floss. It is possible for the harder materials to scratch the softer materials, so it is important to keep them separated. The eggs also come with certificates of authenticity, as there are many knockoff jade products available on the market. Why Obsidian Gemstone? Obsidian is known to be a protective stone that shields against negativity. It absorbs harmful energies from the surrounding environment. It claims to help reduce pain derived from certain conditions. It also is able to help you release disharmony, resentment, fear and anger. Why Rose Quartz? Rose quartz is known to give comfort to the user. It is associated with carrying the energies of compassion, peace, tenderness and healing and helps the user feel a strong sense of self-worth. It has also been used to help rejuvenate skin. This has been my best experience with kegel exercisers so far. There are no fancy gimmicks going on, just a perfectly smooth egg shape made from natural materials. Threading: The dental floss is easier to thread than I expected. The drilled holes are the perfect size and there was absolutely no frustration with adding a retrieval string. Inserting: Each one is INCREDIBLY easy to insert. I don't even need lubricant to slide them in (you might need to use some, and that is OK). The smooth material helps the process. You insert the larger egg end first, because the smaller one has the retrieval string attached to it. It just slides right in to the right positions without any issues or any pain. I was definitely pleasantly surprised. Exercising: I always start with the smallest weight, which in this case happens to be the obsidian egg (black). I gradually increased from to the rose quartz (pink) and then the nephrite (green). I have to say that the weight difference is not intensely different, which is a good thing for me. If I increase weights too quickly, then I lose interest in training my PC muscles. There is only about a 15 gram difference between the lightest and heaviest, so it just adds a small resistance. The sizes were all perfect for me. I still have fairly weak PC muscles, so I like having a medium size egg. The smaller the egg, the more difficult the exercises will be. Removing: All you need to do is find the dental floss and give it a few gentle tugs. The eggs slide right out. The shape always gives me a good giggle because I feel like I'm laying an egg. Cleaning: Cut the dental floss off because it is a one-time use cord. Care instructions are included in the kit. You can clean it with soap and water or you can sanitize by boiling. It is suggested on the website to insert the rose quartz egg into cold water and then start boiling, as inserting directly into boiling water might result in some cracks (like a real egg!). Make sure you clean inside the drill holes. The one flaw is that the website is not gender-neutral. It emphasizes that the kegel eggs are for women. We know a few men who can use them too! We will forever advocate for gender neutrality. We are super happy with this kegel set. Not only are the kegel yoni eggs made of such beautiful materials, but the simplicity of the set is a huge bonus. The smoothness allows for easy insertion and removal, while the weight, size and shapes allow for a comfortable exercise session. This particular kit does not allow for a wide range of challenges, as the three eggs are similar in size and weight. However, there is a large selection of sets available from Genuine Jade that can allow you to choose the difficulty level you desire. Each set lists the approximate sizes and weights. Recommended for: People who look for simple but effective kegel accessories. People who believe in the healing powers of certain natural materials or who appreciate natural products. People who are looking for a small challenge for their PC muscles. Not recommended for: People who prefer a duotone system. People who need a larger challenge (although other sets exist for this reason). This article was originally published at A Couple of Kinks. Reprinted with permission from the author.